It’s shortly after 6pm early in September. I’m walking on a 4.4-kilometre (2.6-mile) boardwalk along the coast in Rigolet, the oldest Inuit community in Labrador. This region is part of Nunatsiavut—“our beautiful land”—and is only accessible by ship or plane (and dog sled and snowmobile in winter). 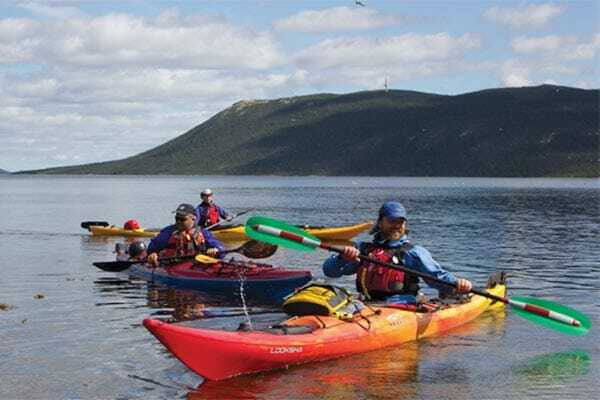 I’m going to meet Benoit Havard, owner of White Bear Adventures, to learn about his kayaking expeditions, in the hope of taking one some day. I had arrived in Rigolet early in the morning, having spent the night in a comfy berth on the Northern Ranger from Happy Valley-Goose Bay (a weekly service that sails up the coast of Labrador, calling at Rigolet, Makkovik, Postville, Hopedale, Natuashish, Nain and back). My plan was to visit the first four Nunatsiavut communities over a period of six days, then fly back to Goose Bay. I had a full day ahead. That morning, Inuit women showed me how to make beaded jewellery and how to pleat moccasins (10 times harder than pulling a drawstring through to gather the toe). I was hopeless, but gained an appreciation for the level of artistry involved. Hopedale, originally called Agvituk (a place where there are whales), was established in 1782 by Moravian Missionaries. The Moravian mission house, storehouses and workshops were made in Germany and shipped in pieces to Labrador. It gives a whole new dimension to the phrase, “some assembly required.”Today, the Hopedale Moravian Mission complex is a National Historic Site. The Mission complex is home to the oldest wooden structures east of Quebec; the church building is in fine shape and is still used by the local congregation. If walls could talk, a lot of the history would come alive. Take the guided tour—it’s a bargain. The seat of the Nunatsiavut Government is here in Hopedale in a handsome new building. The staff will gladly give you a tour and talk about how Nunatsiavut is governed. Note: local Labradorite stone was used to decorate the inside of this building. This gorgeous stone with “dancing eyes” is said to enhance our intuition. If you have time, go to the local quarry (now defunct) where giant pieces were processed and made into slabs. There are lots of bits and pieces lying around! I ate lunch at The Grub Box, the only place to get hot food in the community. It has one small table, and does a brisk takeout business. My chicken burger was so good I had seconds. I smiled when I saw spark plugs listed at the end of the menu. Puts into perspective what’s important—besides food—in this part of the world. After lunch, Martin Shiwak took me scalloping in his small boat. We motored for about an hour then dropped a homemade metal rig that filled with scallops after a short drag. Then we headed to shore to sort the catch, shuck scallops and eat some au naturel. We did this three times before returning to Rigolet. Parting, Martin gave me a bag full of shucked scallops. For supper, I seared a batch, then another and another—until they were all gone. By the time I found myself on the boardwalk, I was stuffed, so I welcomed walking a couple of kilometres to meet Benoit. Eventually, I spotted brightly coloured kayaks sitting on shore; Benoit’s campsite. After a round of introductions, he invited me to join him for supper, which consisted of salmon and trout—stuffed with corn, green peppers and onions—cooked on top of flat rocks over a fire next to the shore. “Love to!” I blurted, not letting on I had just eaten. As dusk started to fall and the fish sizzled on the rocks, a full moon seeped over the horizon. Simultaneously, minke whales surfaced. Locally called “grumpus,” they huffed and puffed their way around the harbour. I had to remind myself to breathe. An hour later, we dined on fish so heavenly that I would not have been surprised to see a choir of angels float out of the forest. I retired to my room at the Sinittavik B&B. So ended day one in Nunatsiavut. If I told you that days two to six were just as magical, you might think I was on some funny stuff—but it’s true. Mind you, there was a wee glitch. I never did get to Makkovik or Postville as planned. The ferry didn’t show up two nights later for the 9pm departure. Nor the next morning. Nor the next night. When it was evident that mechanical issues could tie things up for weeks, I decided to fly to Hopedale on day five (see “…And Up the Coast,”). And so it went—I wandered around, meeting folks like Florence Faulkner, the local garden guru (yes, you can grow vegetables in Northern Labrador!) and Holman Campbell, a seasoned trapper and fine storyteller. After meeting Holman the first time, I was so smitten that I returned, and was offered an amazing meal of moose stew. Speaking of hospitality, it was late when we heard that the ship was still AWOL and I couldn’t leave for the third night in a row. That part didn’t faze me, but the fact that I wouldn’t have a bed was a bit disconcerting. (My room had previously been booked, as I should have been in Postdale by now.) “No problem,” said the owner, Sandi Michelin. “You can spend the night at my house.” Sweet! The Inuttitut word for tourism is silakKijattisinik. It means “the place you go to enjoy yourselves.” It’s all about going with the flow in this big land.